But we have found an issue in our environment that is posing a problem. As we are up-scaling a legacy Access system to SQL Server we also run SQL Server Migration Assistant (SSMA) for Access (32-bit) along with Office 2016 (32-bit). We also have Access 2016 (x32) installed. 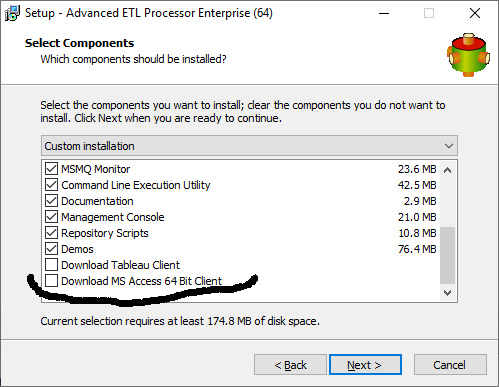 The issue is that versions of AETL above 6.3.4.4 appear to need the 64-bit Access Runtime to access .MDB files. This will no co-exist with out 32-bit Access DAO that was installed via Office 2016. We need some of our AETL transformation packages to work with existing MDB files whilst we are in the up-scaling process. Any suggestions or do we stay at 6.3.4.4? All 64-bit versions of our software have this problem. I have MS office 32-bit installed on my computer if I install 64-bit Access runtime every time I open any MS office document I would get repairing MS Office installation message. So it is not really a problem with our software it is a problem created by Microsoft. Not sure if you are aware but 64-bit version of our software can run the packages in 32-bit mode. That could be another solution.